The three Russian governments bordering the Baltic sea—Courland, Livonia, and Esthonia; belonging formerly to Sweden, with the exception of Courland, which was a dependency of Poland and came into possession of Russia, in part at the beginning of the eighteenth century, and the remainder in 1809. The Jewish population was (1897) about 100,000, out of a total population of 2,386,998. The Jews of the Baltic Provinces differ considerably from other Russian Jews. Their habits, language, and dress are generally much like the German, and, being less crowded and more prosperous than their Lithuanian or Polish coreligionists, their physical development is more satisfactory. The average height of the Baltic Jews called to military service is 163-164 centimeters, while that of the Polish-Lithuanian is only 161-162. In the cities near the German boundary they are more Germanized than in those adjoining Lithuania and White Russia.The commercial affairs of the Baltic Jews were long governed by "ḳahals," who were abolished June 5, 1893. 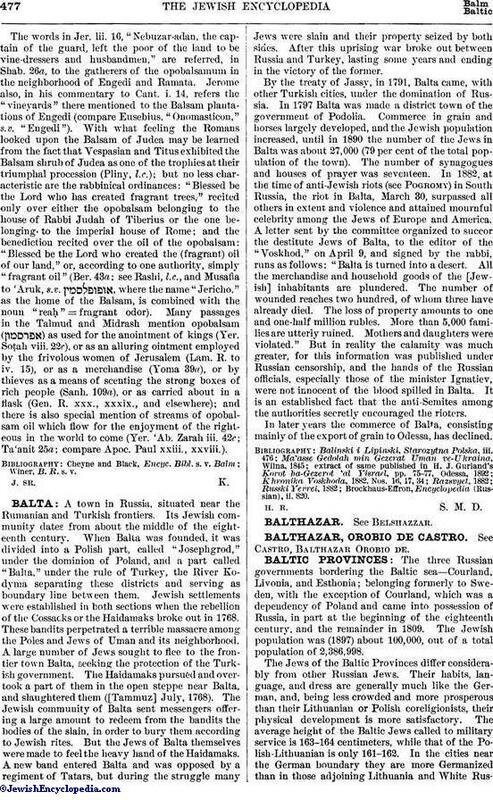 While the legal status of the Jews of the Baltic Provinces has varied under different rulers, they are not included in the list of governments issued by Russia in 1890, but belong to the Pale of Settlement. Jews from other governments have no right to live there. In Courland as well as in Shlock, only those have the right of permanent settlement who were registered in the census of April 25, 1835. 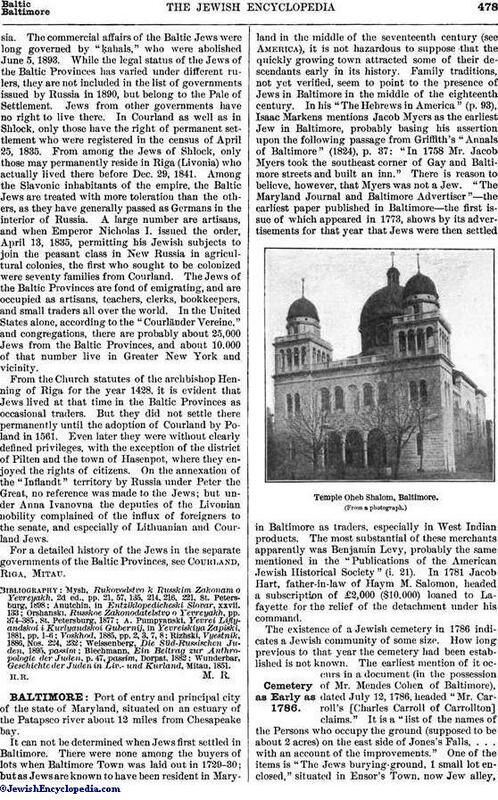 From among the Jews of Shlock, only those may permanently reside in Riga (Livonia) who actually lived there before Dec. 29, 1841. Among the Slavonic inhabitants of the empire, the Baltic Jews are treated with more toleration than the others, as they have generally passed as Germans in the interior of Russia. A large number are artisans, and when Emperor Nicholas I. issued the order, April 13, 1835, permitting his Jewish subjects to join the peasant class in New Russia in agricultural colonies, the first who sought to be colonized were seventy families from Courland. The Jews of the Baltic Provinces are fond of emigrating, and are occupied as artisans, teachers, clerks, bookkeepers, and small traders all over the world. In the United States alone, according to the "Courländer Vereine," and congregations, there are probably about 25,000 Jews from the Baltic Provinces, and about 10,000 of that number live in Greater New York and vicinity. From the Church statutes of the archbishop Henning of Riga for the year 1428, it is evident that Jews lived at that time in the Baltic Provinces as occasional traders. But they did not settle there permanently until the adoption of Courland by Poland in 1561. Even later they were without clearly defined privileges, with the exception of the district of Pilten and the town of Hasenpot, where they enjoyed the rights of citizens. On the annexation of the "Inflandt" territory by Russia under Peter the Great, no reference was made to the Jews; but under Anna Ivanovna the deputies of the Livonian nobility complained of the influx of foreigners to the senate, and especially of Lithuanian and Courland Jews. For a detailed history of the Jews in the separate governments of the Baltic Provinces, see Courland, Riga, Mitau. Wunderbar, Geschichte der Juden in Liv.- und Kurland, Mitau, 1851.